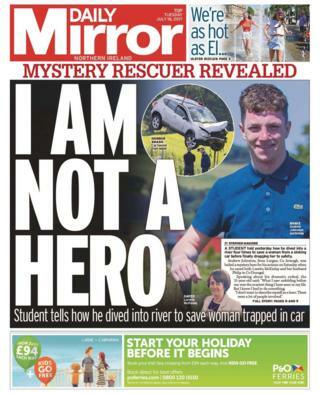 On Monday, the papers were crying out to know the identify of the the "mystery hero" who pulled a woman from a sunken car in the Republic of Ireland. Today he proclaims "I am not a hero." Andrew Johnston, a 21-year-old student from Lurgan, County Armagh, was hailed as a "brave gentleman" for his efforts, but he has since said: "I don't want to describe myself as a hero, there were a lot of people involved. "What I saw unfolding before me was the scariest thing I have seen in my life," reports the Daily Mirror. "But I knew I had to something." The student told how he dived into the river four times to save Loretta McKinlay. He became involved in the rescue when he and his girlfriend came across the scene of the crash and a man ran towards him asking if he could swim. In the water, he saw a man with blood on his face on top of the upturned car. "I am not a gold-medal swimmer," Mr Johnston said, "but I got out to him and asked him if there was anybody else in the car". He said the reply was "not the answer I wanted to hear". Mr Johnston then made four attempts to get to the woman who was trapped inside. "She was unconscious. Her lips were blue - I'd never seen anything like it in all my life," he said. He was eventually able to free Ms McKinlay from the back seat of the car. The story also features on the front page of the Belfast Telegraph under the headline: "I dragged woman from sunken car." The Belfast Telegraph also reports that Ulster University has crashed out of University Challenge during its debut appearance on the show. The university "came within touching distance of victory" last night, but lost out on the win by just five points. The team was made up of mature students, with an average age of 50, who answered questions on topics including Shakespeare and historical travel maps. On the front page of the Irish News, a resident of the Sandy Row apartment block which was damaged by an Eleventh Night bonfire has criticised a DUP MLA's failure to meet residents. The story sits alongside a picture of the towering bonfire. The paper reports that Christopher Stalford, whose office is just across the road from the damaged apartment block, has twice been unable to meet residents. But the MLA said he had childcare responsibilities which have resulted in him being unable to meet those affected. He also said that he would "make himself available" at his office if people wished to see him. But the resident has said Mr Stalford's response was "a joke". On the front page of the News Letter is the story of missing County Antrim man, Dean McIlwaine. "Hundreds join dad in search for missing son," reads the headline. Both the Belfast Telegraph and the Irish News also cover the story. Relatives of Dean McIlwaine, who is from Newtownabbey, have made emotional pleas for him to return home after his disappearance last Thursday. Many volunteers joined searches in Belfast last night and posters showing the 22-year-old barber have been placed around the city, the News Letter reports. He was last seen in the Carnmoney Road area of Newtownabbey. His brother Glen McIlwaine, 27, told the Belfast Telegraph that the disappearance was "totally out of character". 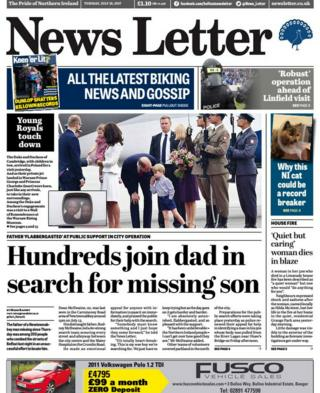 And the News Letter reports that the missing man's "distraught" father led searches from the Mater Hospital to the Crumlin Road on Monday. "Somebody must know something and I just hope they come forward," he said. "It's totally heartbreaking, this is my wee boy we're searching for. "We just have to keep trying, but as the day goes on it gets harder and harder." Other teams of volunteers covered parkland in the north of the city.